Another of the lovely Brazilian orchids flowering now in the Fuqua Orchid Center is Laelia lobata. For most of the year our plants grow side by side with Laelia purpurata in the warm back up greenhouse. 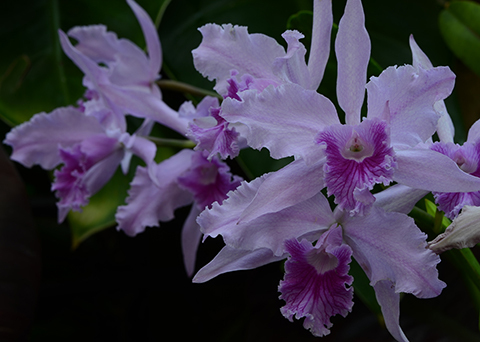 Although their cultural requirements are similar, for some reason Laelia lobata's flowering season is less predictable than that of Laelia purpurata. Sometimes we see a flush of flowers in fall. Laelia lobata is not uncommon in cultivation. Unfortunately its remaining habitat in the wild has become restricted to vertical rocky outcrops around Rio de Janeiro, mainly at 200-800 m. Although it usually grows on rocky substrates, Laelia lobata is occasionally seen as an epiphyte in the canopy of taller trees.